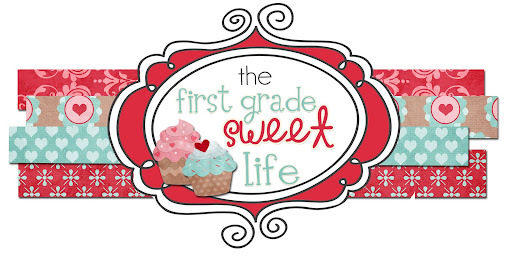 The First Grade Sweet Life: Verbs, Nouns, and Adjectives, Oh My! Today I had a very nice little date with my laptop seeing as we are COMPLETELY SNOWED IN. Seriously, there are GOBS of snow outside. In order to leave my house during the next 24 hours, the National Guard will need to be involved. Thankfully, we have another snow day tomorrow (HOORAY! ), so I won't be going anywhere anyways. And that, my friends, is called wowie wow wow. 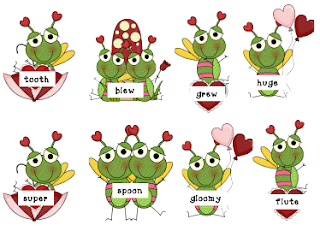 So, here's a little activity for identifying verbs, nouns, and adjectives. 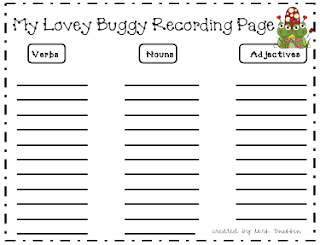 (A recording sheet is included). I felt like celebrating upcoming Valentine's Day so it's appropriately V day themed. Hope you can use it! I've included some picture sneak peeks. Click any picture to download the entire document. That is SO CUTE! Thanks for sharing!! I am following your blog now! 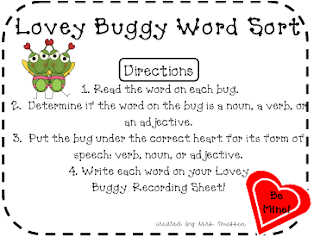 Oh my heavens this is ADORABLE and will be perfect next week for my kiddos! Can't wait to try this! Thank you for sharing! You are so awesome! Thank you for sharing your hard work! Thanks for the first grade ideas. Love it!